The recent events in Honduras have gotten me re-mincing about my year there. A late evening in November of 2005 my friends Lyra, Linda, and I drove back to San Pedro Sula from Tela, winding through banana plantations and the aftermath of tropical storm Gamma. The main bridge was out, so the trip took an extra hour. We listened to Maná as we passed by wooden shacks where a single light bulb glowed blue green in that distinctly Latin American way. We’d come to Tela to pass the day as the country voted for the next president. 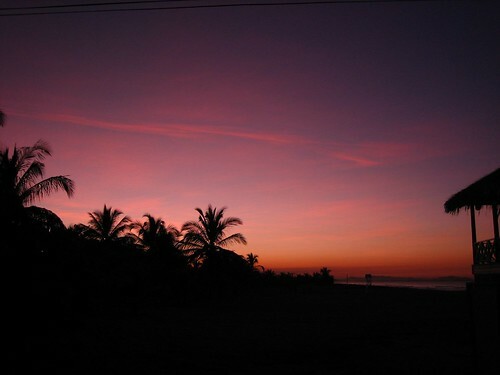 We were upset when we discovered that the elections meant that no beer was for sale, but contented ourselves with some great seafood and an incredible sunset. The run up to the elections had been loud and fascinating. Every morning around 6:30am the trucks began driving outside my windows at El Hogar orphanage in Tegucigalpa, where I was serving as a year-long volunteer. The trucks were mounted with loudspeakers which played a short jingle and then urged voters to select either Mel or Pepe for president. There seemed to be very few formal debates, but every imaginable surface was covered with political posters, and the air was thick with campaign promises. The choice seemed to be between a corrupt socio-path (Pepe wanted to enforce the death penalty for seemingly any suspected gang member) and a corrupt mafia boss (Mel supposedly had ties to crime rings and covered up murders). Hondurans figured that whichever president was elected, they would embezzle a large portion of the aid that flows to the Western Hemisphere’s second poorest nation. Honduras is not a left wing country. I remember my surprise at the incredible words of praise that Hondurans spoke about Presidente Bush. The US Military operates a huge military base in the center of the country which was used to manipulate wars in El Salvador and Nicaragua during the 1970s and 80s. Before that Honduras had largely been run by US banana companies, giving rise to the terminology “banana republic.” The power of the US military and business influence has made a small portion of the population very wealthy, and meant that many Hondurans uphold a strong capitalist, pro-US political voice. Lyra and I used to joke that Hondurans were a people in need of a revolution. Compared to our travels in El Salvador, where there was a sense that the poor could rise up from their situation through education and working to change the governmental and social systems, Hondurans were downtrodden. They lacked a sense of drive and commitment to change. “Yes We Can” were not commonly chanted words in a culture that had constantly been subject to someone else’s military business. This is partly why I find this week’s events so puzzling and sad. 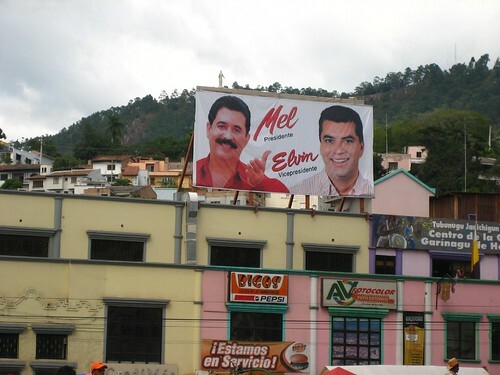 It seems that so few Hondurans are in support of President Mel Zelaya’s supposed swing leftward toward empowering the masses. I suspect this is because Hondurans do not trust their elected leadership. They figured the president would rob the people, and it seems from the reports of embezzling that he has been. Even more puzzling to me is the international response. As we continue to hear calls from the US, UN, Organization of American States, and Chavez to reinstate the democratically elected president I wonder about the sincerity of the desire to help the Honduran people. Realistically the livelihood of the average Honduran took its most drastic downturn when the North American and Central American Free Trade Agreements and the subsidized prices of US agricultural products came together in a perfect storm that drove thousands of campesinos away from farming. Over 50% of Hondurans are unemployed and 1 out of every 6 Honduran citizens live in the United States legally or illegally sending money home to their families. If we really wanted to help the Honduran people we would do more than try to reinstate a questionable leader. We would work to create a market situation in Central America where the family farmers could earn enough to provide housing, food, health care, and education for their families. We would force our companies who employ thousands of Hondurans in maquilas (assembly factories) to pay a living wage. As Lyra, Linda, and I tumbled down the winding back roads on the way back to San Pedro the night of the election I was amazed by the stark beauty and stark poverty of Honduras. I remember a great feeling of gratitude to have the opportunity to get to know these people and this place. I gave thanks to God for the joys and challenges I was facing. Today my prayer is that the people I got to know in Honduras come forward from these challenging times with a chance to dream for a better future. Beautiful and helpful insight. Thanks, Mike.